Just like ketchup on hotdogs and electric scooters that litter the streets, true wireless earbuds are all the rage and, until recently, were markedly more expensive than their traditional wireless brethren. Fortunately for those of us working within tighter budgets, we’re finally seeing an uptick in affordable truly wireless earbuds. Today, we’ll be looking at the JLab JBuds Air to see if these sub-$50 workout earbuds can withstand your regiment. Who is the JLab JBuds Air for? The JLab JBuds Air true wireless earbuds debut price is just under $50. Athletes. What with JLab Audio being the official audio sponsor of Major League Soccer, it should come as no surprise that these earbuds are designed for us athletes. The IP55 dust- and water-resistance makes these all but indestructible. True wireless listeners on a budget. While there are other cheap true wireless earbuds out there, these are actually worth your time. Not much is afforded in the way of accessories, but you can select one of three EQ presets and listen for three hours before having to charge up. Commuters. Aren’t all true wireless earbuds good for commuters? After all, they’re free of wires and more convenient than traditional wireless earbuds. Sure, that’s true, but these effectively isolate you from surrounding noise without the assistance of noise reduction software. Purchasing the JLab JBuds Air affords you two pairs of proprietary Cush-Fins, three pairs of ear tips, a charging case with an integrated USB cable, and the true wireless earbuds. The inside of the packaging is user-friendly and displays the earbuds’ advanced controls; I often referred to these illustrations when learning the ropes. 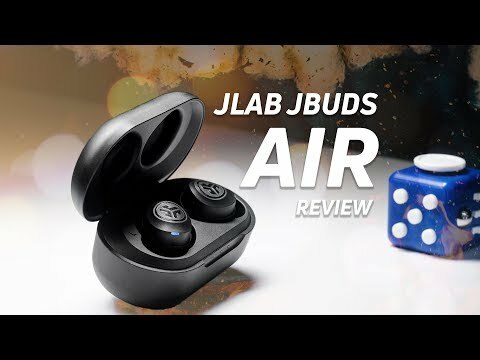 How is the JLab JBuds Air built? The silicone ear tips are comfortable and the Cush-Fins effectively keep the large earbuds in place during vigorous movements. I hope that you’re fond of plastic because everything from the 500mAh charging case to the earbuds themselves are constructed from it. While this does cheapen the look and feel of the JBuds Air, it also keeps costs down and allows for the IP55 durability rating. Whether the trade-off is worth it, depends on the listener, but if you plan on relegating these earbuds to the weight room, then no shame in its all-plastic getup. First, let’s address the biggest drawback of the earbuds: their size. While not as large as the Bose SoundSport Free truly wireless ‘buds, these are bulbous. But don’t be turned away by the appearance, because each earbud weighs just 6 grams. And what the JLab JBuds Air lacks in svelte style, it makes up for in functionality. The included earbuds provide an effective fit that remains stable while running, cycling, weight-lifting, and attempted tree-climbing. The earbuds are larger than the comparably priced Monoprice 30878 true wireless earbuds, but they provide features that the latter don’t such as IP55 dust-and water-resistance. As we’re seeing with more and more earbuds, the nozzles are angled for an ergonomic fit. While it’s fine engineering, the sheer size of the housings, renders this uncomfortable to the outer ear after one hour of wear. While this would be unconscionable for something like studio headphones, it’s par for the course when it comes to workout earbuds as most of us don’t spend more than an hour at the gym anyway. With the included charging case, you’re provided an extra 10 hours of playback and the earbuds automatically charge when holstered. While the shape is fine and the plastic withstands daily use and abuse, the longevity of the integrated USB charging cable is dubious at best. With it being positioned on the bottom of the case, the cable is exposed to potential hazards, which is concerning for long-term use. Aside from basic playback controls, the earbuds allow for advanced control operation, like controlling the volume or accessing your respective virtual assistant — be it Siri or Google — by double-tapping the right earbud. You can control volume directly from the earbuds, a rare feature for true wireless products. Like the JLab Rewind Wireless Retro, clicking either earbud panel three times allows you to cycle through three EQ presets: signature, balanced, and bass boost. Of course, you can also download the JLab app to perform the same adjustments. When speaking through the JLab JBuds Air microphone, my voice is distant and echo-y, and it’s easily lost when there’s even minimal background noise. Taking calls in a completely quiet environment isn’t even a pleasant experience for whoever is on the other end of the call, as it just sounds like you’re speaking from 10 feet away. It’s worth noting, too, all call audio is relayed through the right earbud and is disorienting, even annoying at times. Despite the large size of the earbuds, the case is compact and easy to toss into a gym back. The JLab JBuds Air earbuds are water- and dust-resistant and have an IP55 rating to show for it. Aside from that, they fit extremely well. Sure, the bulky build is an eyesore, but the with the provided Cush-Fins installed, it’s next to impossible for the earbuds to be removed unintentionally. These aren’t just gym-appropriate, though; running outside with these earbuds in is a delight since their shape isn’t conducive to wind noise — that wind tunnel effect that happens with certain earbuds. That said, the earbuds isolate noise well, so you’re going to want to keep to the sidewalks and designated paths to stay safe. Although the integrated USB cable is convenient, it may not be worth the vulnerable placement. Battery life is about average for a pair of true wireless earbuds. Upon subjection to a constant 75dB(SPL) output, our objective testing measured a 3.07-hour playback time. While this isn’t remarkable for truly wireless earbuds, it’s sufficient for most of our commutes and workouts. And running out of juice isn’t a huge worry since the 500mAH charging case provides an additional 10 hours of battery life. A 10-meter connectivity range is allowed by the JLab JBuds Air Class 1 Bluetooth 4.2 support, but it doesn’t provide aptX or AAC support — a shortcoming pardoned by its affordable sub-$50 price. Then again, if you intend to stream videos with the earbuds, you’ll encounter a lot of audio-visual lag, which may be unbearable for some. It’s convenient to have the integrated USB cable, but sometimes it’s easier to find a micro-USB cable than a USB input. Thankfully, the auto on and connect feature works without a hitch every time the earbuds are removed from the charging case. This makes listening to the earbuds a pleasant experience that is only occasionally interrupted by intermittent connectivity stutters. These are cheap true wireless workout earbuds and naturally sound like cheap true wireless workout earbuds. Low-end frequencies receive plenty of emphasis which is great for keeping you pumped during your routine, but clarity and midrange frequency perception suffer. Again, if you don’t intend to use these beyond the trail or gym, the sound quality is appropriate — potentially ideal for some — but if you’re hoping to get a jack-of-all-trades deal out of the JLab JBuds Air, you’ll want to into some truly wireless alternatives. For the sake of consistency during testing, all songs will be discussed through the lens of the JLab balanced EQ preset. For the record, switching from balanced or signature to bass boost makes a huge difference, but alternating between balanced and signature is harder to differentiate especially when passively listening. Signature, however, amplifies the bass and treble frequencies while balanced attempts a more neutral-leaning reproduction. In Pynk by Janelle Monae, the song opens with a synthesized bass line coupled with snapping, and the low-end is emphasized — although not terribly so — from the get-go. Comparing the JBuds Air to the Sony WF-SP700N, the former produces less clarity than the latter because of auditory masking. The JLab JBuds Air earbuds are large but stable when worn with the included Cush Fins. A clear example of how the bass emphasis impacts the midrange frequencies is anytime that Monae sings the word “pink.” If you want to hear this in succession, skip ahead to 0:21. Each time Monae sings “pink” her the “-nk” consonant sounds (/ŋk/) are masked by the bass. Although this is something that self-professed audiophiles actively avoid, those of us who want to use these for exercise will thoroughly enjoy the bass boost in balanced mode. It’s not overwhelming, but it asserts a noticeable presence. If you want something with even more oomph, feel free to opt for the bass boost mode. For me, however, it was too emphasized and severely undercut clarity. Youth performed by Daughter is recognized for its ability to elicit disparate, solemn feelings from listeners. The minor notes plucked from the guitar difficult to hear above the drum hits during the chorus. The fundamental frequencies are audible, but the delicate harmonic resonance that we Daughter fans have familiarized ourselves with are lost to the kick drum. Again, although this may be a shame for analytical listeners, we gym-goers don’t tend to contemplate the harmonic resonance of an Am chord while finishing up our set of rows. Yes, these are one of few cheap true wireless earbuds that are worthy of your ears. Not only are you afforded sufficient 3-hour standalone battery life, but the earbuds are also IP55-certified and seamlessly auto-connect to your device when removed from the case. As with any bargain product, there are some drawbacks and the JBuds Air is no exception. The lack of aptX or AAC support is aggravating but logical at this price-point and the vulnerable USB cable — while a unique design — is concerning. If you’re not sure about true wireless technology, the JLab JBuds Air is an affordable, low-risk option. If there was ever a time to give true wireless earbuds a try, it’s now with the JLab JBuds Air; $49.99 seems dramatically low for such technology as we’re accustomed to seeing truly wireless competitors in the $120-and-up price range. Time to GO on the move, in a pinch, out the door. Grab your JBuds Air True Wireless Earbuds as you head to work, get to the gym, or jump on an airplane. A 3-4-hour battery life with Bluetooth 4.2 gives you just enough power to get through those music moments. Their innovative charging case provides 10 extra hours to the earbuds so you can charge back up quickly. Automatically turning on and connecting to each other right out of the case, they provide hassle-free technology. Perfect for on-the-GO moments.